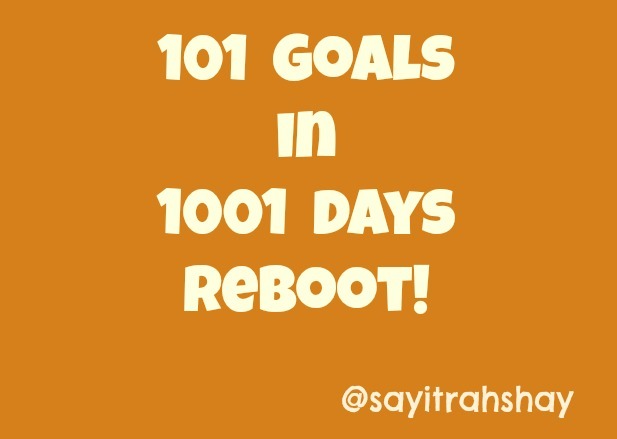 101 in 1001 days - Say It, "Rah-shay"
I’ve rebooted my 101 in 1001 goals list! Check out the new post here. Feel free to stay here and read through my old goals and then check out what my new ones are. During a blog hop I saw the idea of 101 goals in 1001 days and fell in love with the concept. Unlike New Year’s Resolutions that I willfully admit that I make and soon after abandon, this list and the time frame seem so possible. 1001 days is about three years, precisely two and three quarters of a year. That is more than enough time for me to get things done. Also, I like lists. I may not always get things on my to do list completed but I sure dive into a new list with all of the gusto and enthusiasm that I can muster. So I am challenging myself to complete the following 101 activities. The activities range from serious to silly and I am just going to have fun with this. I found these guidelines on another blog and this helped me focus on some things that I would like to do. It’s sorta like a bucket list but since the term ‘bicket list’ makes me think of Jack Nicholson in a hospital gown [shudder] here I am calling it 100 in 1001 days. The guidelines I am following I found on a blog called My LA Blog. Why 1001 Days? Many people have created lists in the past — frequently simple goals such as new year’s resolutions. The key to beating procrastination is to set a deadline that is realistic. 1001 Days (about 2.75 years) is a better period of time than a year, because it allows you several seasons to complete the tasks, which is better for organizing and timing some tasks such as overseas trips or outdoor activities. Blue text and strikeout through text for items completed. 32. Start a game night with friends (both mine and The Bee) that can coincide with dinners or not. 37. No eating out for a week. Ok. As I looked through my list some things seemed to contradict others (ie go to Aruba/ Save money) but I figure since I have until 2014 to complete this list there is room enough for both. Join me on this journey, I haven’t decided if I am going to start another blog just for the 101 in 1001 or just blog within my ‘regular’ blog. As I read through the list I saw that there was little work related goals and after doing a mental debate I’ve decided that the things I want to do from this list may not be specifically library chick related but I think a well rounded me will lead to a better work me.